Possibly the most complete Travel Baseball Program you can tryout for in 2015. - Coaches are encouraged to play as many games as possible. Plus - Travel Players have the Mahwah Rec program, which add about 12 games. 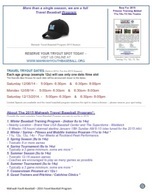 The Mahwah Baseball Program is designed to give Players solid training (indoors and outside), and field time. * Costs are subject to change. Our goal is to provide a great experience for a low cost. Tournaments are selected by the coaching staff. Up to Two Tournaments may be included in the Travel fee. . Additional tournaments may be arranged on a team basis for an additional fee. Some clinics may be an additional cost. 8u team cost will be lower as there is no summer season planned for 2015. 12u Teams will have additional costs related to the Cooperstown experience and tournament, and will have additional games at Cooperstown area tournament. See "cost" section below. Length of Seasons, actual games played and tournaments may vary by age group and can be affected by weather. For 2015 the new 8U team will play only in the Spring. Mahwah Travel and Rec Teams play on "real" field sizes. Our Travel and Rec field sizes are in line with the nations best travel and rec programs. For example at 11u and 12u, Mahwah does not use the smaller 46-60 field as some towns and other travel programs will do. Once a player enters 5th grade even our Rec program moves to 50/70 fields. Mahwah residents can get this robust program for just a few hundred dollars for Winter, Spring AND Summer !! Want even more baseball training ? Your Confirmation Text will appear on this page after you click on submit. .
Travel tryouts are scheduled at PBI in December 2014, (Dates TBD). This information is subject to change so please make sure to check the website at www.mahwahyouthbaseball.org. You will receive a separate confirmation as well as specific dates and times for your players tryout. Please Read the Travel Rules Above to determine your players Team Choice. If you are still not sure, select not sure. You will receive a confirmation email. If you have any special needs or questions please indicate below. The travel program assembles teams of Mahwah residents, by age, for the spring and summer seasons. These teams represent Mahwah against travel teams from other towns. NEW FOR 2015 our youngest age group will be 8U. The program also has teams at the 8U, 9U, 10U, 11U, 12U, 13U and 14U age levels. in mid-July and can run through the end of the month. 6. Every age group may participate in a Memorial Day weekend tournament. The Players selected for travel teams are chosen via a tryout in which a player’s skills are evaluated in the areas of hitting, fielding, throwing, and running. Tryouts are being held in December 2014 for the 2015 season. To allow for a proper evaluation of each player’s skills, the travel program will hold tryouts at a local indoor facility and may conduct at least one outdoor session, weather permitting. The PLAYERS AGE for team participation is as of April 30 of the respective year. Because this age cutoff date spans multiple school grades, players must identify the team -- 8U, 9U, 10U, 11U, 12U, 13U, or 14U -- for which they wish to be considered before the tryout. The player will be evaluated only for the team for which he selects. If you are unsure, please choose a level, and make a note in remarks and the Travel director will review it with you in advance of the tryouts. NOTE: ( Mahwah Rec uses the Grade Age, and Mahwah Travel uses Travel Baseball age (as of April 30). Most Mahwah players are encouraged to play with the grade, unlike many club teams that encourage players to "play down". Parents are obligated to pay an additional travel registration fee if their child makes the travel team. The 2015 Travel Baseball costs are not finalized as we work on securing a location (s) for our winter workouts. Prior season Registration Fess have run about $375 for the program. For reference, the 2014 travel registration fee was $200, plus an additional $175 for indoor winter workouts beginning in January. The 8U program will be a lowers cost since it is winter training and spring season with one tournament. There is no charge for trying out. In addition, each player is obligated to pay for their own personalized uniform, which will be arranged through the travel director and respective team head coaches. Costs for the uniforms in the past have been $120. Costs, however, are subject to change depending on current prices. Financial assistance can be provided needed. Payments will be collected after the teams are selected. Note: If a travel team coach from the prior year expresses a desire to coach again and is the only applicant for the position, then he or she doesn't have to submit a new application.